Why is it important to improve on-farm irrigation efficiency? Around 20% water delivered is lost in distribution channels, 60% of water used for irrigation is applied using high volume, gravity irrigation methods, that is around 10-15% of water applied to crop is lost through over watering.Return from crops can be enhanced, natural resources can be well protected and long term sustainability of industries can be improved and many more. How can on farm irrigation efficiency be improved? Adopting technology that better matches irrigation water application to plant water requirements. Installing infrastructure, such as recycling systems and piping to improve on-farm storages and delivery systems. Reconfiguring irrigation layouts and using and developing infrastructure to improve in-field application systems. Monitor soil moisture between irrigations. Use the information to guide irrigation timing decisions. Base amount of water applied on crop need. Know the flow rate and the time required to apply the desired inches of water. Improve infiltration uniformity by turning irrigation water on and off as it flows down the furrow. If fields are more than 1000 feet long, consider cutting the furrow run length in half with a corresponding decrease in set time. Use practices to increase uniformity among furrows (e.g., torpedoes, extra tractor trips, etc.). Collect surface runoff for recirculation or reuse elsewhere. To the extent possible, operate sprinklers during the least windy periods. Alternate the location of lateral pipes on successive irrigation events. When the pressure variation throughout the system is excessive. Use appropriate lateral hose lengths to improve uniformity. Use drip tape that has a small emitter discharge exponent. Check for clogging potential by conducting water analysis and fertilizer/water compatibility tests. Every use of water has a physical cost in terms of either quantity or quality. 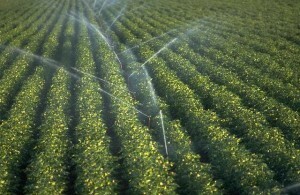 Irrigation has a high physical cost in terms of quantity of water because large part of it for growing crops is consumed and is directly returned to atmosphere.Side effect of irrigation is change in the quality of the water not consumed and in recent times this problem has grown significant with extensive use of fertilizers . All water delivered by irrigation which returns to a water source in reusable condition should be termed as irrigation return not an irrigation loss.Irrigation returns include surface run-off and deep percolation components as most deep percolation are not lost rather returned in form of increased water table. Recharging ground-water bodies. A large portion of irrigation returns enters local ground water systems and forms important source of water for municipalities, industries and residences.Creation of wetlands as they can be home to many endangered species and can help protecting environment and natural resources, as they can be created and sustained by surface and sub surface return from irrigation diversion upstream. 1.1 Why is it important to improve on-farm irrigation efficiency? 1.2 How can on farm irrigation efficiency be improved?